And a couple that is totally feeling the love right now? Gigi Hadid and Zayn Malik. Gigi, 21, has declared her feelings for 24-year-old Zayn with a super-sweet Instagram Story. 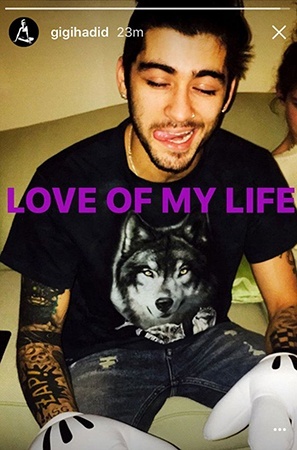 The model posted a photo of Zayn looking like a total dreamboat (obvs), on the social media site, and added the text: "Love of my life." But back to Zayn—Gigi recently revealed to Ellen DeGeneres how her and the Pillowtalk star met. "We played it cool for like 10 minutes and then I was like, 'You're really cute.'" she said. "We connected like, really quickly, and just—we just started, like yeah, we had the kind of same sense of humor and [started] sharing videos and obviously Noah Ritter videos started coming up." Who'd have thought a little ginger kid with a love for the word "apparently" could bring two worldwide megastars together.